Is it just me or does fall trigger a baking fever in you too? As soon as the weather starts to cool, I’m ready to fire up the oven, cover myself in flour, and fill the house with the scent of cinnamon and nutmeg. I think I’ve baked more in the last two weeks than I did the entire summer. This is very good news for you if you have a sweet tooth. Not as great of news if you’re on a diet. My apologies in advance. The latest in my baking ventures is this simple, elegant apple tart. There’s so much I love about this recipe it’s tough to know where to begin. 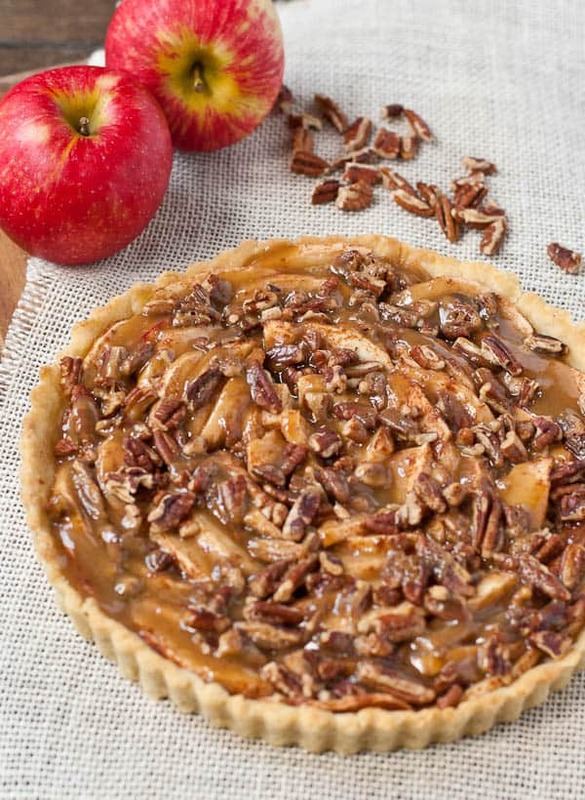 It tastes like apple pie, but it’s a lot less work. The crust is DIVINE, and easy to boot! And the caramel sauce is so good, you’ll want to eat it with a spoon (or a straw, whatever’s fastest). But let’s start at the beginning. This crust. I am so stinkin excited about this crust. I’ve already found three fabulous pie crust recipes, and I rotate them based on the time I have and what I’m looking for. But when I saw David Lebovitz‘ recipe for a French tart crust made with melted butter, I knew I had to try it. The method for this crust is a little unusual. 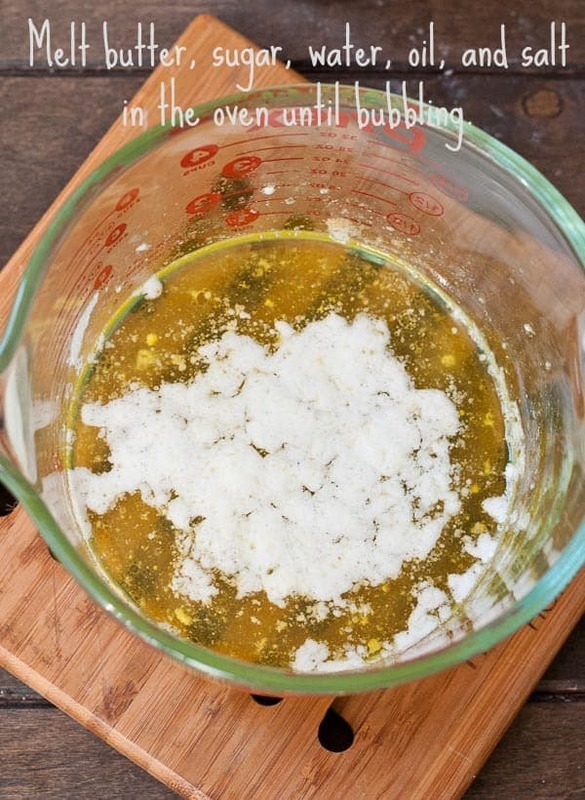 It starts with butter, vegetable oil, water, and sugar, which gets melted together in the oven until the mixture is bubbly and the butter is just starting to brown. You then remove the (caution:HOT!) bowl from the oven and dump a rounded scoop of flour on top. A quick note about the flour. David’s measurements are all in grams, but if you don’t have a scale, your best bet is to scoop the flour out of the bin or bag leaving it with a slightly rounded top. I measured the flour several ways, some with spooning the flour into the cup and others with scooping, and the scoop with rounded top is the most accurate way I found. The important thing is to pay attention to the consistency. After you dump the flour in, stir it together until a ball forms. The dough will be slightly wet, but it should be moldable. Think warm play doh consistency. This makes me ridiculously, ludicrously happy. Who knew amazing tart crust could be this easy?? Once the dough has cooled enough to handle, you can press it into the tart pan, using your fingers to press it against the sides. The tart is baked for 15 minutes, which gives you just enough time to peel and slice the apples and toss them with some cinnamon and cardamom (cardamom is a divine fall spice–I definitely recommend picking some up, but you can omit it if you don’t have any on hand). 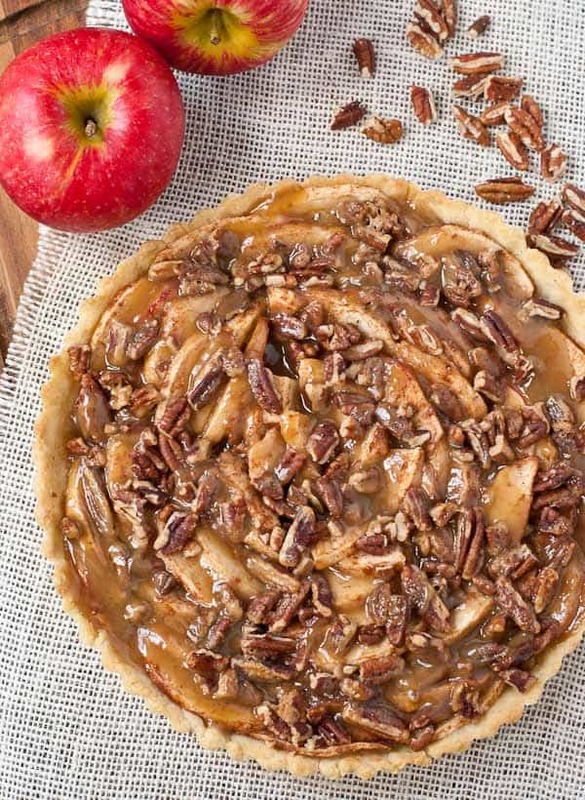 When the tart crust is done, arrange the apples in the pan as prettily or haphazardly as you like and sprinkle them with chopped pecans. Then pop them back in the oven for another 20 minutes. In the meantime, you can make the caramel sauce. You may recall this Maple Caramel Sauce from the Peach Slump I made back in August. I cannot get enough of this stuff. It is so easy to make, and it tastes incredible. A million times better than anything you can buy in the store. And that’s not an exaggeration. After 20 minutes I pulled the tart out and drizzled it with all but about a 1/4 cup of the caramel. Then I popped it back in the oven and baked for about another 10 minutes, which left the apples soft but still with a bit of crunch. 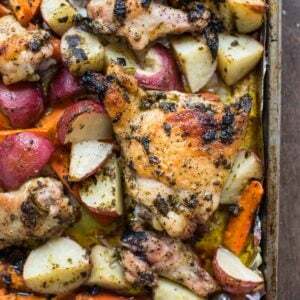 This recipe would be a great twist for your Thanksgiving table. I served it warm with ice cream and an extra drizzle of caramel sauce. 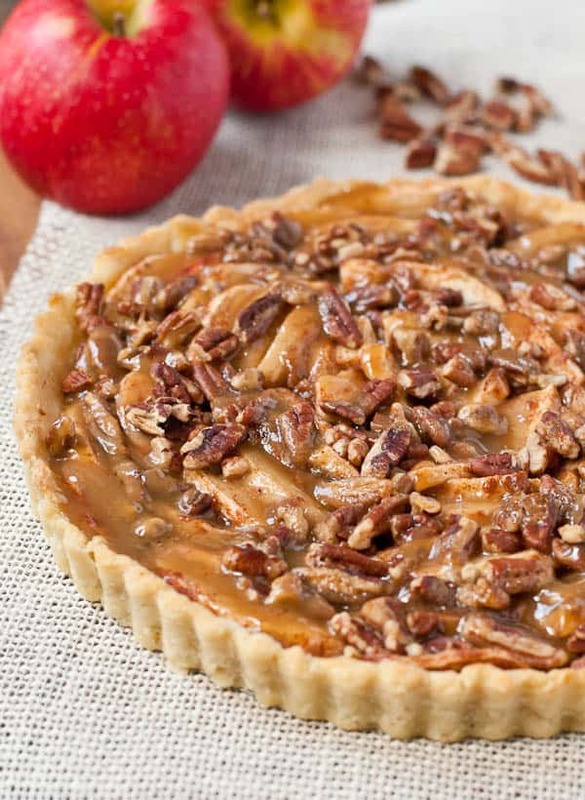 I like this tart because it’s a little less “soupy” than traditional apple pie. The apples aren’t cooked before they go into the tart, so they retain some of their firmness and bite, which I love. If you find yourself dipping the extra crust pieces in the maple caramel sauce, you’re in good company. We should definitely be friends. Preheat the oven to 400 degrees. In an oven safe bowl, combine butter, oil, water, sugar, and salt. Place the bowl in the oven for 15 minutes, or until the butter is bubbling and just starting to brown. Carefully remove the bowl of butter from the oven and set on a hot pad. Dump in the flour and use a wooden spoon to stir the mixture together until the dough forms a ball. Once the dough is cool enough to handle, transfer it to a 9 inch round tart plate with a removable bottom. Press it down with a spatula, then use your fingers to spread it evenly across the pan and up the sides. 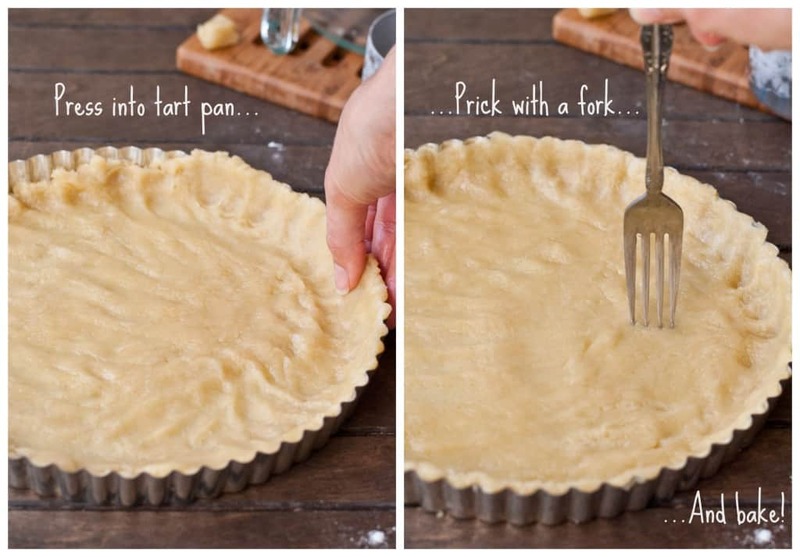 Prick the dough with a fork. Place the tart dough back in the oven and bake for 15-17 minutes, or until the edges are starting to brown. While the tart bakes, peel the apples and cut into thin slices. In a bowl, toss the apples with cinnamon, cardamom, sugar, and flour. Remove the tart dough from the oven and reduce the temperature to 375 degrees. 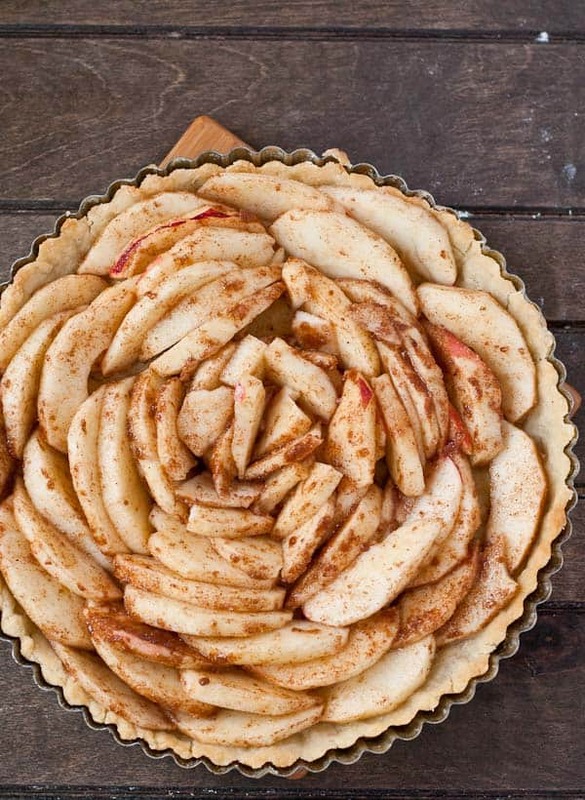 Arrange the apple slices inside the tart. (I stood them up against each other in concentric circles.) Sprinkle with pecans. Place the tart back in the oven for 20 minutes. While the tart bakes, prepare the caramel sauce. In a small sauce pan, melt butter. Add the maple syrup and cream and bring to a boil. Continue to cook, stirring constantly, until mixture thickens and coats the back of the spoon. Stir in sea salt. Remove the tart from the oven and pour all but 1/4-1/3 cup of the sauce over the top (You want everything to be well covered in the caramel.) Return to the oven for an additional 10-15 minutes or until apples are softened. Serve warm with ice cream and leftover caramel sauce. 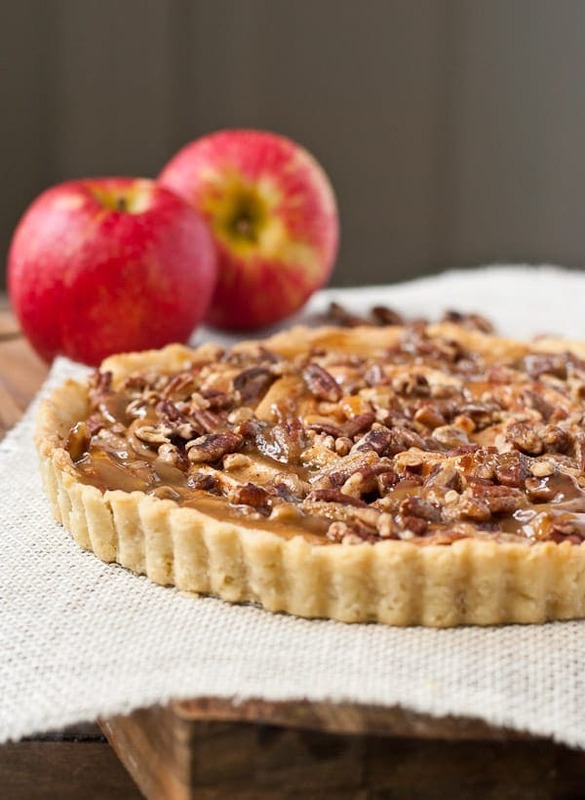 Looking for more cozy, fall dessert recipes? Check out The Best Dessert Recipes collection of apple recipes! Courtney, this tart is gorgeous. . my belly will join yours in welcoming October if that means I can have a big slice of this! 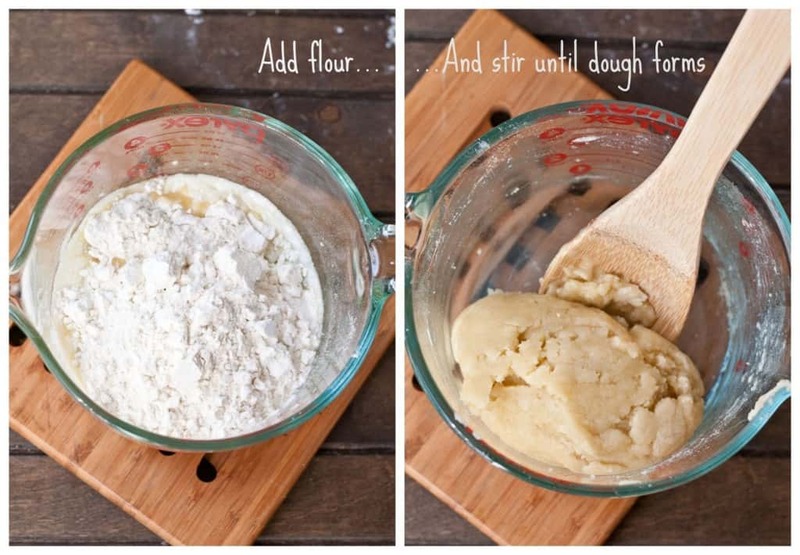 and totally going to try this pastry crust method! Ermagaaaaaawd Courtney, this tart is da bomb! It’s absolutely gorgeous (that crust looks like a total winner. 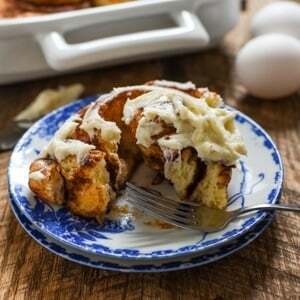 I NEED to try it) and good call on smothering it with that delicious caramel sauce. I’ve been drooling over this ever since I first saw the photos on Facebook. Did you and Will eat the entire thing? I sure hope so! The crust is AWESOME. And so ridiculously easy. You will love it! Unfortunately, we took the tart to the party so I only got one slice. Guess I have to make it again! P.S. I love when you go on commenting tares. It makes my day! This looks beyond amazing! In the last photo it shows the tart removed from the pan. How did you accomplish that without it all falling apart? Thank you Katie! I recommend using a tart pan with a removable bottom. Once the tart is cool you should be able to just lift it out from the bottom and the sides will comes right off! I made this for a family dinner last night – everyone loved it. I made it exactly as the recipe says to do. No variation – the crust was scrumptious, the caramel was delicious and the flavor was wonderful. I’ve never used Cardamom before and will be using it in future recipes. It goes great with apples and cinnamon. Thank you for sharing this – it’s a keeper! That is great! I’m so glad it was a hit. Thanks for coming back to let me know! For the maple caramel, what kind of cream do you use? Looks awesome, want to try this for the holidays! Sorry for the delayed response. I use heavy whipping cream. I made it exactly as per directions and it turned out beautiful and delicious. The only problem I encountered was the leftovers (yes there were a couple of slices); the crust was incredibly hard! So hard that it was left on the plates. I covered it and left on the counter top. Did I not store it properly? I’m glad you enjoyed it! I’m a little stumped on the crust problem. It’s been awhile since I’ve made this, but I don’t remember the crust ever hardening so badly. I do usually store at room temperature. It’s possible the crust was a tad overbaked, which caused it to harden. I’m sorry you didn’t get to enjoy the leftovers with all the crust! Hi! Looks amazing! Can’t wait to try it! Wld I b able to make this tart in advance and freeze for around a week till serving? Thank you! I haven’t tried this myself, but I think it could be frozen after step 5–so I would bake the tart, but leave off the caramel sauce. When you’re ready to bake, I would defrost overnight in the fridge, warm in a 350 degree oven, and then add the caramel sauce the day you’d like to serve. Hope that helps! This is THE BEST dessert I have ever served! I increased the spices and bought a small crystal pitcher for serving the salted maple carmel sauce as this recipe tops the list of Family Favorites and presents so beautifully! Wow! This comment just made my day! Thank you so much for sharing. I’m so glad everyone enjoyed it and I definitely think that sauce deserves its own fancy pitcher! what other type of apple can you use? Jonathans or Jonagolds, Braeburn, or even Galas.